Moscow, April 16, Interfax - Patriarch Kirill of Moscow and all Russia has had telephone conversations with heads of Christian Churches over the missile strikes of the Western coalition counties on Syria. 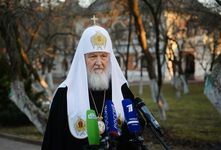 "There is a desire to continue talks with the heads of the Churches in order to stop bloodshed," Patriarch Kirill told journalists at his residence in Peredelkino, Moscow Region on Saturday. In particular, the talks with Pope Francis took place at the initiative of Patriarch Kirill. "It is impossible to keep silence," the patriarch said. He said that he was satisfied with the held talks and that every of his interlocutors treated the discussed matters with understanding. In addition to Pope Francis, Patriarch Kirill held talks with patriarchs of Constantinople, Jerusalem, Antioch and Alexandria. Christians "should influence the situation the way to stop violence, to stop war, so that there are no of those horrific victims that there are today," Patriarch Kirill said in response to a question from Interfax-Religion correspondent about the details of conversation with Pope Francis. "This was a vividly peacemaking dialogue," he said. The Church can influence public opinion and at the same time the Church has "no political goals," he said. The conversation between Patriarch Kirill and Pope Francis lasted for about 15 minutes.